Zamil Steel Construction Company (ZSCC), a subsidiary of Zamil Industrial Investment Co (Zamil Industrial), has been awarded a new contract worth SR31.7 million ($8.5 million) by the Saudi Calcined Petroleum Coke Co (SCPC), ZSCC announced. ZSCC will erect steel buildings for the company’s new warehouse in the eastern region of Saudi Arabia. The scope of the contract includes the supply and erection of more than 3,000 tonnes of pre-engineered steel buildings for SCPC’s new GPC warehouse in Jubail Industrial City. SCPC is one of the largest kiln coke calciners in the Middle East. Upon the start of production in 2017, the company will have capacity to produce 666 kilotonnes of calcined petroleum coke per year, which will serve the aluminum, steel, and titanium oxide markets in Saudi Arabia and the GCC region. “The project is made up of several component parts that require completion within a defined time frame and demand an exceptional degree of attention to detail in keeping with the company’s needs for stringent safety and security control,” ZSCC said in a release. “It also requires a high level of coordination among different parties during the various stages of the project in order to ensure the quickest completion time possible and achieve the complete satisfaction of the client, it added. 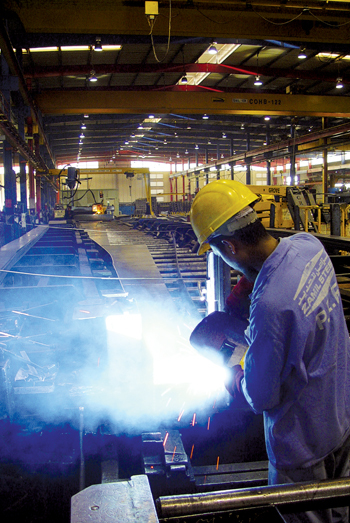 ZSCC caters to clients that require comprehensive solutions for industrial and commercial steel structures. The company provides engineering, procurement, and construction services for setting up new projects in different market sectors. Its expertise covers the design, fabrication, and supply of steel buildings as well as related civil and concrete works; erection of steel buildings and the installation of firefighting and fire alarm systems, architectural materials, and mechanical, electrical, and plumbing works on the basis of turnkey contracts through full site management teams. The contract from the Saudi Calcined Petroleum Coke Co was the second deal announced by the company this year, the first being the award of a turnkey contract worth SR39.8 million by the Tamimi Markets Company Ltd. for its new store in the eastern region of Saudi Arabia. ZSCC will perform all engineering, procurement, and construction work including meeting the civil, electrical, mechanical, structural, and architectural requirements as well as providing external and utilities works at Store number 106 of Tamimi Markets, located in Al Rakah district on Dammam-Khobar highway. The new store project is a fast-track undertaking that includes many components. It will require an extraordinary level of attention to detail due to complex safety and security requirements, which must be satisfactorily completed within a challenging time frame, ZSCC said. Earlier this year, Zamil Steel PEB hosted a delegation from Eiffage Métal, part of the Eiffage Group in France, an industrial design and comprehensive supply leader in turnkey metal construction markets across Europe and worldwide. Members of the delegation and Zamil Steel engineers discussed potential areas of cooperation during the visit, including opportunities in the areas of manufacturing and erection, the scope of each party’s capabilities with regard to the Line 3 project, and possibilities for other upcoming projects. A corporate presentation by Zamil Steel’s marketing team and a tour of the production line at the PEB facilities were other highlights of the delegation’s visit.